I first read Northern Lights several years ago, but for some reason I never got round to reading the other two novels in Philip Pullman's His Dark Materials trilogy. Therefore, in order to read The Subtle Knife and The Amber Spyglass I thought I'd re-read this first to get back into the series. I really enjoyed it, and will admit to be blown away by Pullman's ideas.Lyra's world is like a parallel world to our own. It seems to be several years behind our own, almost Victorian, but with some rather amazing technology thrown in. Several (rather large) differences exist; the church (or Magisterium) virtually runs the world, being hugely powerful; there are witches and there is an entire kingdom of apparently vicious armoured bears that live in the North. Perhaps the greatest difference is the existence of something called a daemon (still pronounced demon) which is essentially someone's soul but in physical form. As children, these daemon's can change shape depending on the circumstance, but as an adult they settle into one specific shape-usually saying something about the person themselves. This difference between adults and children becomes increasingly importance as the story progresses; eventually turning into a sickening plot point through which Pullman introduces the idea of original sin.The plot in general, whilst containing mild tones of a fight against religious oppression, is really a mystery adventure story, beginning in a parallel Oxford and heading up to the North, with Lyra at the heart of it, experiencing all sorts of misadventures and meeting all kinds of characters. Essentially, children begin to go missing, including Lyra's best friend, and after escaping from the company of the more than dodgy Mrs Coulter she joins the gyptians in heading north to find her friend and all the other missing children. It's pacy, and whilst Pullman is not afraid of using pretty tough language considering the novel is aimed at children, the plot speeds along at a good pace.This is partly because the central character, Lyra, is pretty awesome. She's a young female character who reminded me a little of Mary Lennox in her stubbornness, but she's also brave and fearless and it was really refreshing to see a strong female protagonist. Alongside her; Mrs Coulter is a wonderful antagonist, and Lord Asriel-a relation of Lyra whose appearance at Jordan College kicks off Lyra's interest in the North-is an equally fascinating character, his 'goodness' becomes less and less certain as the novel continues. Also interesting are Fader Coram, an elderly gypsy and Serafina Pekkala, a head witch in the North. 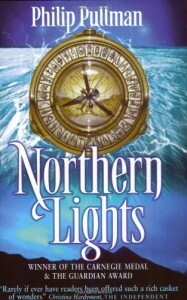 But pretty much all the supporting characters are well-fleshed out.If you haven't yet read Northern Lights, or have only seen the film adaptation The Golden Compass, I strongly urge you to read the novel. The ending is hugely powerful in the novel and Pullman's prose is brilliant.